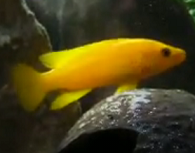 The Lemon Yellow African Cichlids is a favorite among fish hobbyist, made popular for its striking yellow color appearance, not only on its whole body but the fins as well. Unlike normal Lake Tanganyika cichlids which are usually of larger size, the lemon yellow is much smaller measuring just less than 10cms in length for the full grown adult fish. Just like its African cichlids cousins, the fish is somehow quite aggressive and should not be mixed into the community tank. Aquarium setup to house your lemon cichlids should have a network of caves which you can create yourself using a self made mold and later constructed using cement. To make things look natural you can consider decorating with lots of live plants especially Java Fern for them to hide in. Usually what I can see is that in order to save cost, certain hobbyist prefer to use half cut 4” PVC pipes so that it plays the same role as well. The tank base can be filled with small gravels and rounded pebbles and I would suggest in order to complete this setup, you can use an undergravel aquarium system so that it plays a dual role, not only to make things look nicer but it can help to filter your aquarium water as well. The water condition in which your lemon yellow cichlids live in should be slightly alkaline within the pH range of 7.5 to 8.5. Measurement for water hardness should be above 10.0 dGH meaning that the water should be extremely hard in nature. To achieve this, what you can do is by adding mineral salt which is readily sold in aquarium stores. There are different types of salt but be careful not to mix up because what you need is actually the type of salt mixture that mimics the mineral composition present in the natural Lake Tanganyika and not the one made specifically for marine aquarium. For better accuracy and to know how much to add, basically you will need a digital hardness meter reader as well so that you can get the precise reading that you require and in the event the hardness level drops, you can quickly adjust back to the desired hardness level.